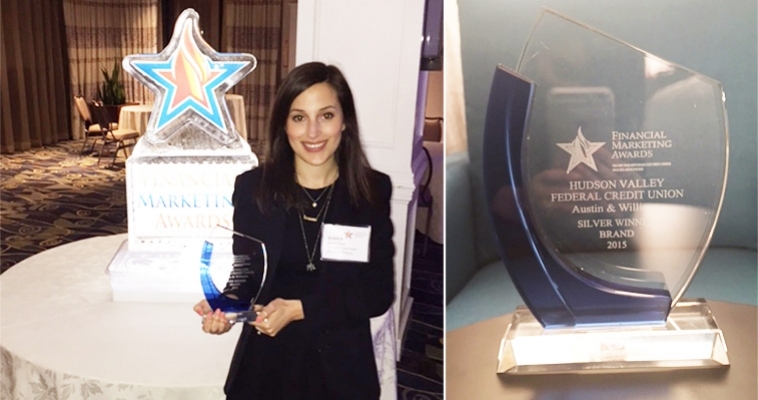 Austin & Williams recently took home a silver 2015 Financial Marketing Award for longtime client Hudson Valley Federal Credit Union (HVFCU). The agency’s “There’s a Reason People Bank Here” campaign was selected in the branding category from scores of entries submitted this year for the award, considered New England’s oldest and most prestigious event recognizing creative marketing and branding. The same campaign also took top honors last month, earning a 2016 CUNA Diamond Award in the annual credit union competition, which attracted more than 1,100 entries. “What makes winning the Financial Marketing Award so gratifying is that our campaign was selected because of the results it generated as well as overall strategy and executional creativity,” comments Rick Chiorando, A&W CEO and chief creative officer. Forty percent of each entry’s total score was based on the results it achieved. According to Chiorando, during the branding campaign period, top-of-mind recall for HVFCU increased 2%; deposits and loans grew 4.1% and 2.39%, respectively; and new member growth increased 1.09% at the $4.1 billion not-for-profit financial institution. The agency has a strong concentration in financial services marketing and advertising and a proven track record helping credit unions, community banks and regional commercial banks achieve their key performance goals.